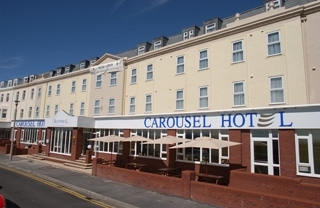 Incorporating 92 en suite bedrooms, A la carte restaurant, Carousel Lounge Bar, Fylde Conference Suite makes the Carousel Hotel Blackpool the perfect venue for business or pleasure. The Carousel Hotel is situated on the New South Promenade. Exit M55 following directions to Blackpool Airport. Go past the airport to the jct with the Promenade and turn right. The Carousel is located 100m on the right-hand side.